It's been two years since the events of Gangsterland, when legendary Chicago hitman Sal Cupertine disappeared into the guise of Vegas Rabbi David Cohen. In September of 2001, Rabbi Cohen’s temple is thriving. The mortuary and cemetery—where Cohen has been laundering bodies for the mob—is minting cash. But Sal wants out. He’s got money stashed in safe-deposit boxes all over the city. He only needs to make it through the High Holidays, and he’ll have enough to escape Vegas, grab his wife and kid in Chicago, and start fresh. Across the country, former FBI agent Matthew Drew is running security for an Indian-owned Casino outside of Milwaukee, looking for vengeance for the murder of his partner. So when Sal’s cousin stumbles into the casino one night, Matthew takes the law into his own hands—again—not knowing that the Native American mob, led by an enigmatic assassin named Peaches, plans to take over the Chicago Family. Into his crosshairs fall Sal’s wife and son, unprotected as the structure of the Chicago mob falls away. When the horrible events of 9/11 occur, and the authorities move all of their resources to battle this new enemy, all the gangsters in the nation know they have free reign to run wild. This powder keg threatens to expose Rabbi Cohen, with the post-9/11 world closing in around him. 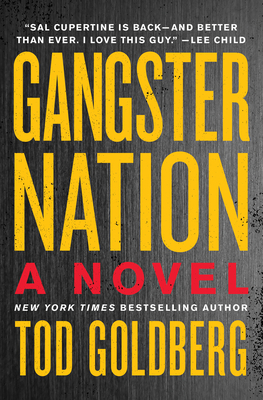 Gangster Nation is a gritty, darkly funny story of the greed and ambition that have fueled the rise of a nation, proclaiming Tod Goldberg as one of the most provocative crime writers of his generation. TOD GOLDBERG is the author of more than a dozen books, including Gangsterland, a finalist for the Hammett Prize; The House of Secrets, which he coauthored with Brad Meltzer; and the crime-tinged novels Living Dead Girl, a finalist for the Los Angeles Times Book Prize, and Fake Liar Cheat, plus five novels in the popular Burn Notice series. He is also the author of the story collection Simplify, a 2006 finalist for the SCIBA Award for Fiction and winner of the Other Voices Short Story Collection Prize, and Other Resort Cities. His essays, journalism, and criticism have appeared in many publications, including the Los Angeles Times, The Wall Street Journal, Los Angeles Review of Books, Las Vegas Weekly, and Best American Essays, among many others, and have won five Nevada Press Association Awards. He lives in Indio, California, where he directs the Low Residency MFA in Creative Writing & Writing for the Performing Arts at the University of California, Riverside.